Microsoft used data obtained from Windows Phone devices, the Windows Phone web marketplace, and the Zune software itself to arrive at the conclusion that a large amount of users either use their device or the Windows Phone website to view/download applications. This is the simple reason why Zune, which has always been intended for Zune devices only (and will have a different future regardless), has been ousted from any Windows Phone relations. The removal of Windows Phone from Zune begins today, the Zune HD marketplace will remain open. 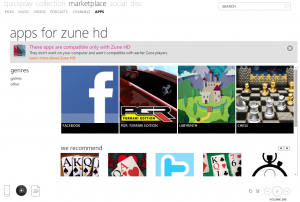 The Zune software is still required for Windows Phone software updates, and backing up photos/videos from your device, also music downloads are still part of the Zune software. Why are we doing this? Marketplace is growing fast. It now has over 80,000 apps overall and is available in 54 (soon to be 63) countries around the world. 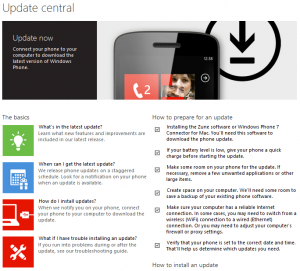 Requiring Windows Phone 7.5 is part of a larger effort aimed at improving Marketplace performance and security, and paving the way for even faster growth and more new features. If you don’t update to Windows Phone 7.5, you’ll still be able to browse Marketplace. But you’ll get an error message if you try to install an app or game, or update one already on your phone. Still need convincing that updating is worth it? Check out some of the hundreds of improvements and new features Windows Phone 7.5 makes possible. The Windows Phone marketplace has expanded to nine new markets today as well. Those markets are Bahrain, Israel, Iraq, Kazakhstan, Qatar, Saudi Arabia, Thailand, UAE and Vietnam. These new markets are part of the big expansion plans discussed in the past couple months. Applications submissions are already available for these new markets.